Within and around the sweet beach community of Sandbridge are endless hidden gems. Each of these local treasures are worth its own post detailing the history and legends of special interest to visitors and locals alike. 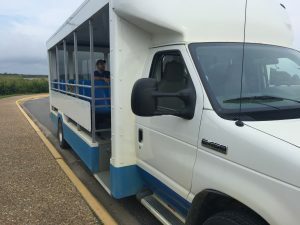 Some are “hidden” right under our noses and one of these is the “Blue Goose” tram service that takes passengers from the Back Bay Wildlife Refuge visitor center to and through False Cape State Park. Though the nine-thousand acre Wildlife Refuge and the forty-three hundred acre State Park adjoin each other, visitors can only get back to the State Park by bicycle, foot, or tram. Passengers can look forward to learning about the history of the Refuge as the volunteer driver points out various wildlife and plants on the trip. Sightings may range from coyotes, osprey, herons and snakes with the rare feral pig trotting through the State Park. During the four hour trip visitors experience six different habitat areas, from beach to maritime forest. Though each trip is a bit different, a highlight is certainly the one mile guided hike into history that takes visitors to Wash Woods, the site of a former settlement founded in part by shipwreck survivors that fell victim to the well-known Graveyard of the Atlantic. The trip is appropriate for children and adults alike. Hikes and interpretation can be adapted to meet the needs and interests of the riders. Bug spray, water, and snacks are recommended but limited varieties are also available for purchase at the State Park visitor center part way through the trip. The Blue Goose leaves the Back Bay visitor center at 9AM daily from Memorial Day to Labor Day, with weekend trips only beginning in April and ending in October. Plan to arrive early, as seats are on a first come-first served basis. The cost is $8 for adults and $6 for seniors and children 3-12, payable by cash or check only. There is an additional charge of $5.00 per car and $2.00 to walk or ride into the Refuge. Seasonal passes may be purchased at the visitors center. For additional information, contact the Back Bay Wildlife Refuge at 757-721-2412 or https://www.fws.gov/refuge/back_bay/.